One of the best pieces of fashion advice I could ever give you is this: buy a leather jacket. Or a vegan leather jacket, if you so choose. Either way, save up your money, and splurge on a leather jacket that fits nicely, isn’t too heavy or light, and feels comfortable. It will quickly become a staple in your wardrobe that you’ll wear all the time, and you will always feel extremely *cool* when you wear it. One of my favorite clothing items I own is a vegan leather jacket I got from Volcom about four years ago. It’s baggy enough to fit over heavy sweaters but not so oversized that it looks ridiculous. It’s incredibly comfortable and is perfectly worn. It looks good with anything I wear it with – jeans and a t-shirt, feminine dresses, even sweatpants. It’s my favorite thing to wear in the fall with a big scarf and in the spring when it’s a little chilly. I am, in short, obsessed with it. Here I am in it! 1. A super simple outfit that literally looks like fall is a leather jacket layered over a plaid shirt. Add jeans and some boots, and you’ll look adorable and seasonally appropriate! 2. I personally love the contrast of a leather jacket and an old sweatshirt. Layer your jacket over a sweatshirt with jeans for a casual, comfortable look that will take you through the weekend. 3. Opt for two fall trends at once and wear your leather jacket with a pair of loafers. Even with loose jeans, the look gives off a sophisticated and chic vibe. 4. Another way to look super chic in your leather jacket? Drape it over your shoulders instead of, you know, putting your arms in the arm holes. 5. You can make a summery dress work for colder weather by wearing it under a leather jacket. Add accessories like over the knee boots and a hat to stay warm. 6. Heading from the gym to go out? Or just don’t feel like wearing jeans? A leather jacket dresses up sweatpants in an unexpected way. 7. 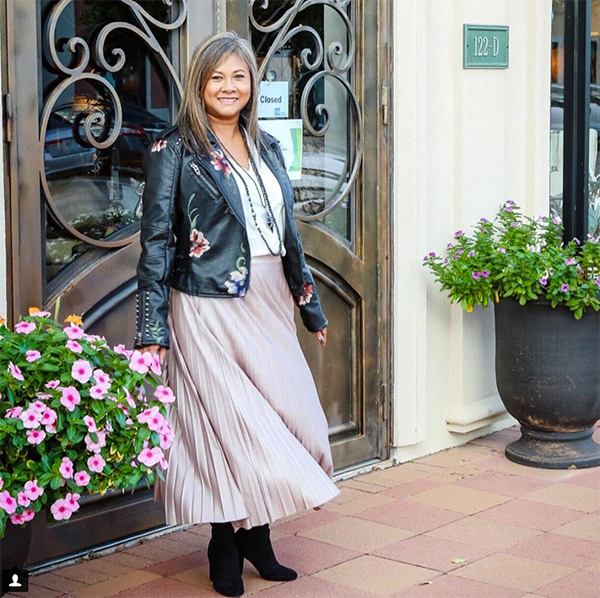 Mix two fall fabrics by wearing your leather jacket with a suede skirt. The look is perfect for chillier weather when you add ankle boots. 8. 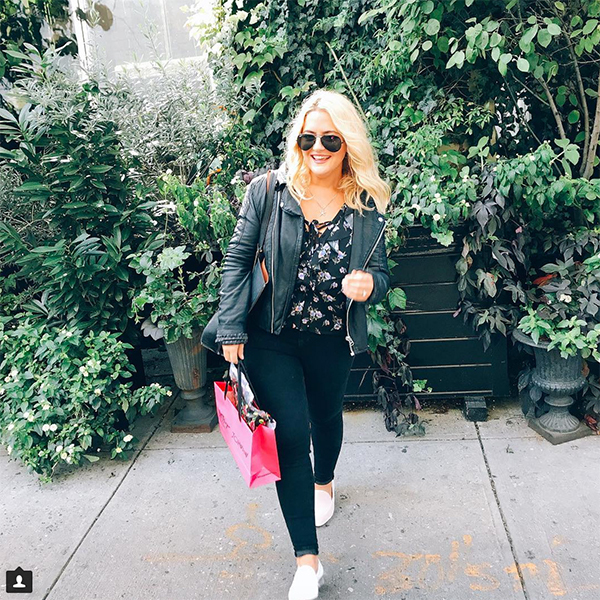 I love pairing my leather jacket with feminine pieces, like this floral top and pink velvet loafers. 9. A giant scarf with a leather jacket and will keep you super cozy on the days where you should probably honestly be wearing something a little bit heavier than a leather jacket. 10. 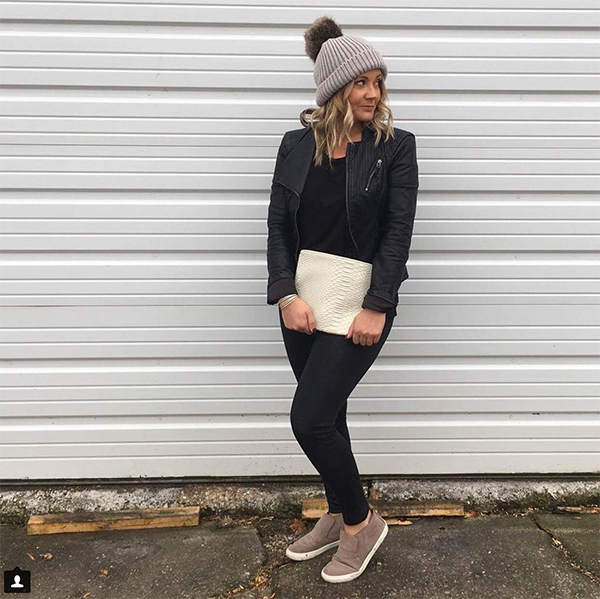 Keep it simple by wearing your leather jacket with jeans, sneakers, and a cute beanie. 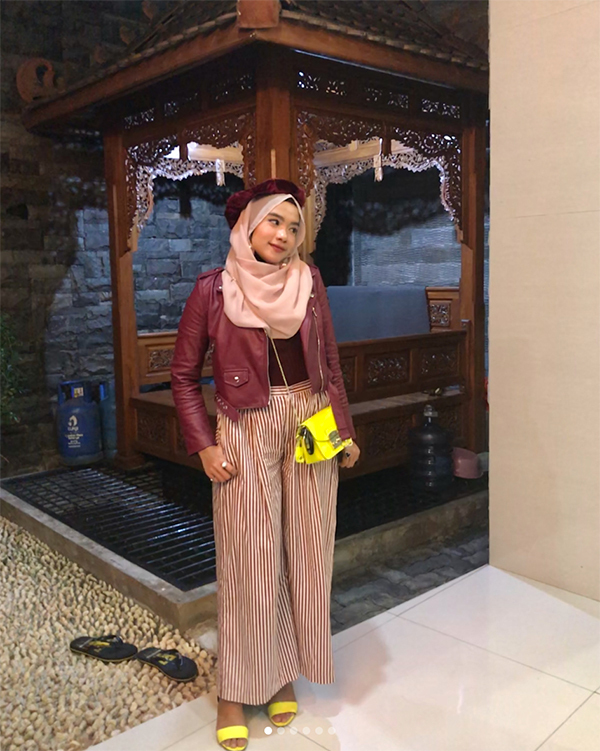 This is a super easy outfit that can be thrown together quickly and still look good. 11. This is one of my favorite outfits on this page. 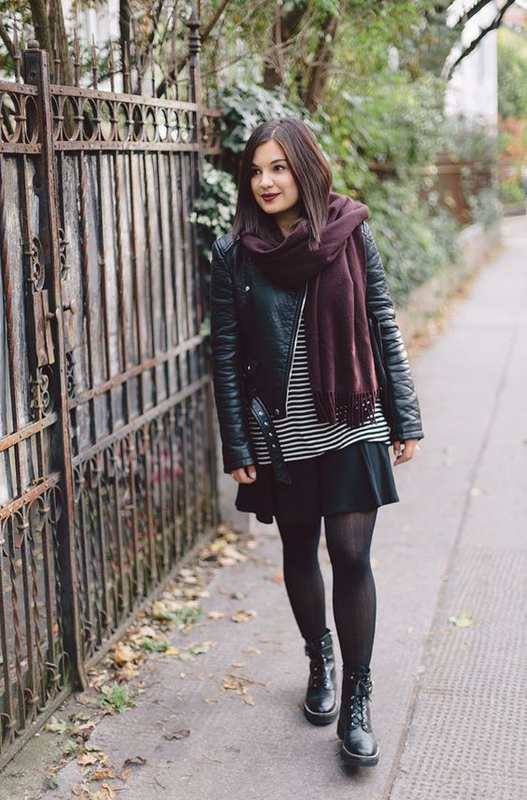 Wear your leather jacket with a striped shirt, a skater skirt, tights, combat boots, and a cozy scarf. 12. 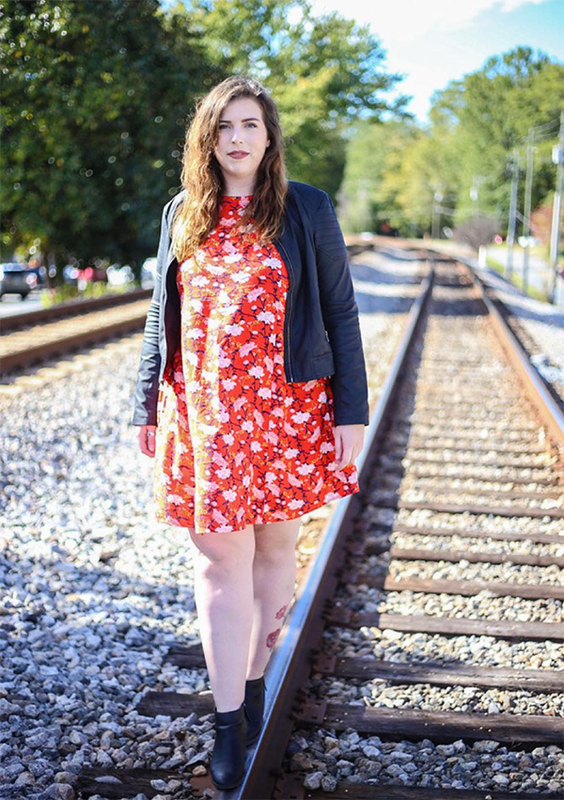 A floral sundress can work for colder weather with a leather jacket and some ankle boots. You might not even need tights! 13. Don’t feel like you have to stick with a black leather jacket – colorful jackets look great too. I love how this burgundy jacket matches with her striped pants. 14. Stay super cozy while also looking super chic by wearing a turtleneck under your leather jacket. Sneakers keep the look very casual. 15. Opt for a leather jacket with embellishments if you want to do something different – this one with floral embroidery is so pretty. 16. 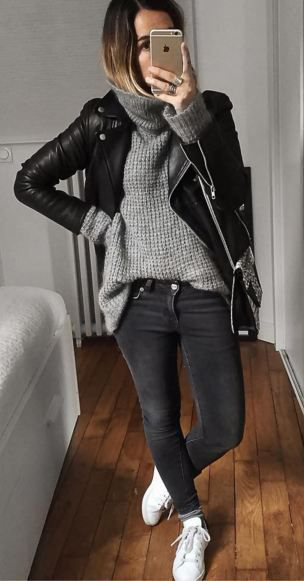 Here’s a go-to fall outfit: leather jacket, sweater, scarf, jeans, and knee high boots. Perfect, easy, and versatile! 17. For a super chic and cool look, just do all black: black leather jacket with a black sweater, black jeans, black accessories. Add sneakers to be more casual or ankle boots to dress it up a bit more. 18. 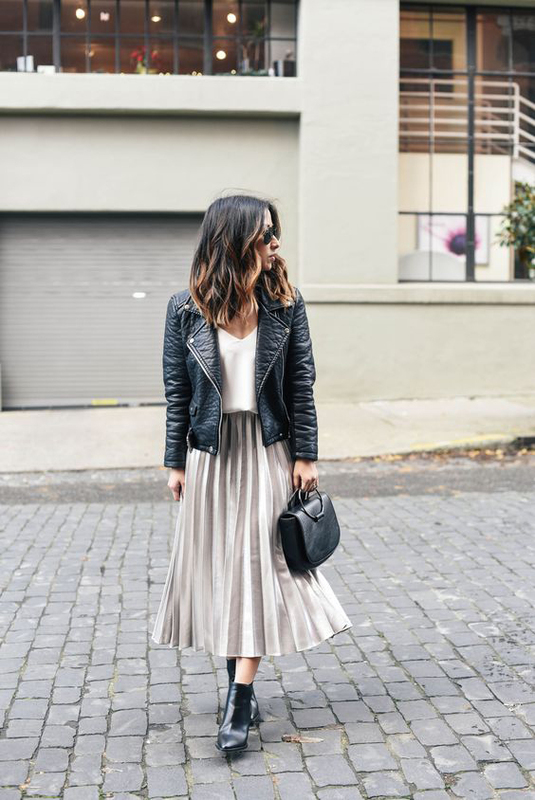 Create a nice contrast by wearing an edgy leather jacket with a super feminine clothing item, like a pleated skirt. Ankle boots round out the look perfectly. 19. 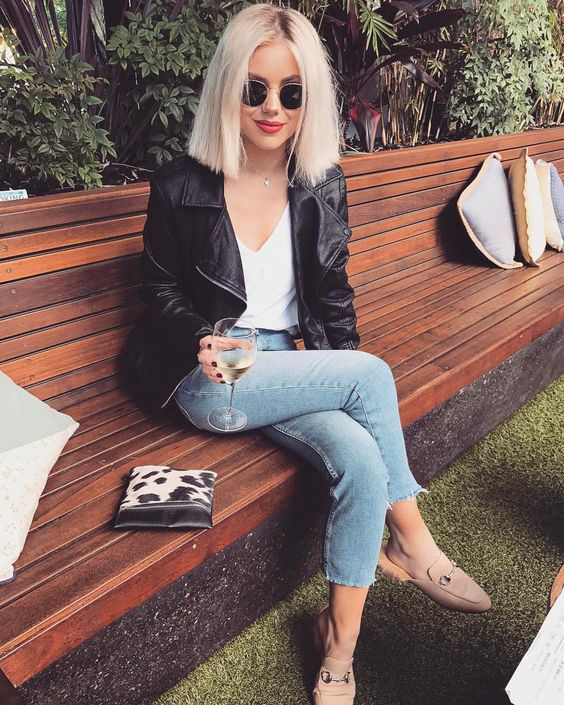 When in doubt, wear your leather jacket over a white tee with jeans and loafers. Add a red lip and you’ve got a comfortable look that is still glam. 20. Layer your leather jacket over an open plaid shirt and a tee for a casual and cute outfit.